"Ecumenism is the constant search and finding of what unites Christians and the constant rethinking of what sets them apart. This attitude of fervent prayer, humility, studying each other and cooperating in concordance is the vector, backbone, and essence of the contemporary ecumenical movement". "The Institute for Ecumenical Studies strives to broaden the ecumenism of life rooted in friendship, an authentic source of knowledge both for theology and for the humanities". -To promote, by means of international conferences and publications, interdenominational, international and interdisciplinary reflection on the contemporary ecumenical movement, taking as a starting point theological dialogues and academic research in progress within the Christian world. -To support practical initiatives in Ukraine that bring Christians together to take part in the formation of a pluralistic and tolerant society. -To offer an academic, modern, and interactive education in ecumenical studies. 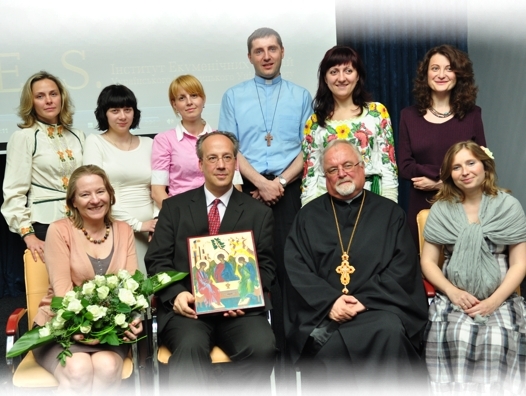 Mission of the Institute is to develop a Master’s degree program in Ecumenical Studies in Ukraine and abroad and facilitate ecumenical dialogue between churches, civil society and policy makers.